Figaro (Stephen Hegedus) is only a day away from a lifetime of wedded bliss to his beloved Susanna (Miriam Khalil) and you are cordially invited to Against the Grain‘s unique production of Figaro’s Wedding. This zany and modern adaptation of Wolfgang Amadeus Mozart’s Le Nozze di Figaro, with a modern libretto by AtG’s own Joel Ivany, highlights the many ways a wedding can go wrong: even before the bride takes her walk down the aisle, wandering eyes and personal vendettas get in the way. Set on the top floor of Queen Street’s historic The Burroughes, Against the Grain have once again taken a classic, complete with stunning operatic performances, and turned it on its head. Figaro’s Wedding is a comic opera which is both timeless and ageless and can be relevant in every era for quite simple reasons. Humans will always be governed by their emotions: love, desire, greed and power. Figaro and Susanna are ecstatic to be so close to their wedding day, if only everything around them will start balancing out! Being hounded constantly by the event manager, the minister, the florist, and the wedding planner for bills that need payment – as everything comes with a fee – is cause enough for a stressed out couple. The two must also battle the chaos within their own wedding party. Figaro’s boss and Best Man Alberto (Alexander Dobson) has wandering eyes for Susanna, thus incurring the wrath of his wife Rosina (Lisa DiMaria), Susanna’s best friend and Maid of Honor. Cherubino (Teiya Kasahara), the young and feisty lesbian teen living with Rosina and Alberto, has developed a growing fondness for Rosina and is building up the courage to act upon it. Alberto, determined to let nothing steal away his Rosina, is none too happy. Everything comes to a head right at the altar. There is so much to love about this production. The performance in the exciting Burroughs space is not set upon a stage while the crowd stares up from seats below. No, the audience is actually there to attend Figaro’s wedding. Some are even given wedding gifts to leave on the gift table: as I entered, I was given a bright yellow gift bag and was told “you bought it from The Bay and it took you months to find it!”. This production is site-specific and acts as a “follow the action” story where the audience moves between two spaces to follow the story. Another grand selling point to this production is the modernization of the story while still maintaining operatic integrity. The story is spoken and sung in modern English while throwing in modern references (Susanna, in song, admonishes Figaro before the wedding to “stop looking at your iPhone!”) as well as local references (Figaro, in an effort to protect Cherubino from Alberto’s anger, makes an excuse saying she was with him all day running wedding errands and he just dropped her off in Mississauga). Beyond all that, the most spectacular part of the production is the music. The live piano (performed by Maestro Tophski) and string quartet (Music in the Barns Chamber Ensemble) were simply remarkable. The immense talent that this cast possesses is breathtaking, and the operatic performances are phenomenal. Khalil and Hegedus immediately wowed the audience from the opening number but who really caught my attention was Kasahara’s rock and roll portrayal of Cherubino, a departure from the original character of a young male to a young lesbian female. Her deference, her spontaneity and delightful teenage naivete defied by the maturity and power of Kasahara’s voice had me floored. My date for the evening, Mark, had his own reservations for seeing the opera as his idea of entertainment usually involves a firefight and aerial stunt work and though I assured him that despite this not being The Expendables, he’ll still enjoy himself. And, at the very least, humor me! Many times I caught him mesmerized by the music and subsequently laughing along to the antics pre, during and post wedding. He later expressed that the fact that the performance was modernized and in English (and therefore he wouldn’t get lost trying to catch up with supertitles) was what kept his attention. I couldn’t agree more. Being as this is also wedding season spring for me, having attended one friend’s wedding over the Victoria Day long weekend with another wedding coming up, attending Figaro’s Wedding in between was the perfect accompaniment to maintain my momentum of matrimonial excitement. And for one hilarious romp (with one performance left!) it is definitely the best way to fill an evening this weekend. Figaro’s Wedding is playing at The Burroughes (639 Queen Street West, 6th floor). Performances run from May 29-31 and June 2 at 7:30 pm. Tickets start from $35 and can be purchased at the door and online. 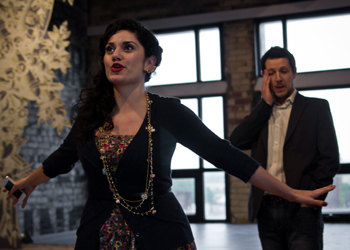 Photo of Miriam Khalil and Stephen Hegedus by Roger Rousseau.